Make doing you household chores easier and more efficient, with the fantastic range of cordless vacuum cleaners available at Gtech. Their high performance combined with the lightweight nature, make moving from room to room much simpler. Shop now for cheap outdoor furniture available with this deal. Whether you love or loath gardening, your sure to love a discount for Gtech. Happy gardening! Where do I use my Gtech voucher code? Select the code you wish to use on NetVoucherCodes.co.uk. Follow the link to the Gtech page. Shop for your Gtech product. Go to the basket when you are ready, enter the coupon code in box bottom left, then click ‘apply coupon’. Press green ‘checkout’ button and complete your transaction. "Due to it’s reduced power consumption the AirRam will save you £252 over five years, based on the assumption that you vacuum for three hours a week, every week." As leaders in the design and manufacturing of innovative, cordless products, Gtech aims to make your life easier whilst we aim to make it cheaper! With our offers & discount codes, you could save money whilst you shop. Gtech produces world leading products featuring the Gtech AirRam, AirRam Multi, Ebike and a wide collection of garden tools. Whether cleaning carpets or hard floors, The Gtech AirRam allows you to do both with ease and without the need to change settings! Being a lightweight vacuum, the cleaner enables you to glide through your home and is easy to lift up stairs. Whilst the AirRam makes floor cleaning easier for you, here at Netvouchercodes, we could make it cheaper with one of our discounts & voucher codes. If you want to fall in love with cycling again, then the Gtech eBike can help you do just that! Ride it like a normal bike, but as soon as you pedal, you will feel the powerful lithium-ion battery and motor pushing you forward giving you that added boost; completely different to riding a normal bike. Hate riding up hills? Wave goodbye, with the Gtech eBike, hills will feel flatter, the bike will do all the hard work for you. Bike riding is made so simple with the Gtech eBike, simply pedal to go faster and brake to go slow, nothing more and nothing less! There are no confusing gears or oily chains either, it’s been replaced with a clean carbon belt drive as used on high-performance motorcycles. With the eBike, you’ll be able to explore further and arrive fresher, so be sure to check it out today using one of our discount codes. The Gtech Multi has been designed to be the perfect partner for the AirRam. It has all the cleaning performance of an upright vacuum in a lightweight hand-held vacuum. Rather than fiddle around with attachments on your vacuum that can become lost over time, the Gtech Multi includes everything you need to reach even the hardest of places in your home! The handheld nature of the Gtech Multi allows you to make short work of sofa’s, stairs and car interiors, plus the extension tube and concealed flexible hose help you reach all the nooks and crannies from your floor to your ceiling. Don’t forget to look for Gtech multi discount codes and offers above to save you money and get the best price. Gtech’s Cordless Falcon Lawnmower is compact, easy to use and best of all, powerful! The simplicity of the mower is genius, there are no cables to untangle or avoid during cutting. Simply insert the battery, press the lever and go! The precision carbon steel blades give a wide cut and allow you to cut close to your boundaries too. The blades can also be adjusted to achieve the cutting height that you desire. The collection bin boasts a generous 40-litre capacity and is easy to see when it needs emptying. Once you have finished mowing the handle folds down for a compact and clutter free storage. How can I find which model number I have? To find the model number of your product, check the rating sticker on the products and the model number is printed in the right-hand top corner. Do Gtech sell Car Kits for the Gtech Multi? Yes, the Multi Car Accessory Kit, which contains a small upholstery tool, a crevice tool, and a soft dusting brush. 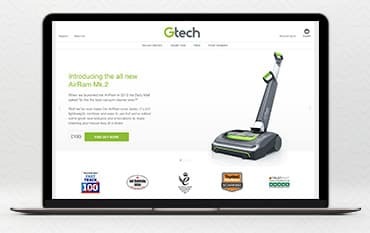 Gtech online specialises in innovative, high-performance cordless floor care, garden & car products, along with e-bikes - all boasting industry leading design & quality. You can save money on Gtech’s vacuums, lawnmowers & e-bikes using a Gtech Voucher Codes at gtech.co.uk. Gtech has pioneered a wide range of products including cordless vacuum cleaners such as the air Ram mk2 & G tech multi. They sell a wide range of garden tools including a cordless lawn mower, grass trimmers & also power sweepers sw22, sw20 & sw02. All Gtech’s products are cordless, yet still, offer high performance through their expert engineering. Being cordless by design, these products are naturally easier to use round the house saving you time with their portable nature. Although not expensive, such advanced functional products are not cheap either, but you can often get a reduction by using one of our Discount Codes below! We are constantly on the hunt for first order Voucher Codes for Gtech to help you with your money saving. Our experts check dozens of sites for secret codes including NHS discounts, student sites & social media channels saving you time & money!